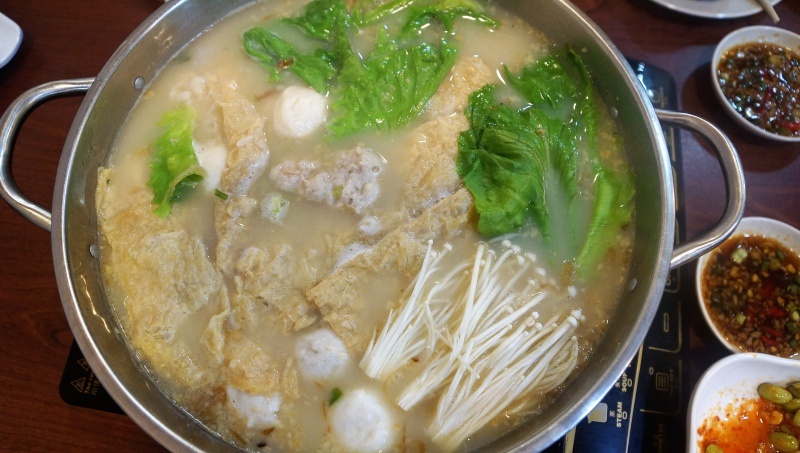 “Lai…lai….Teo chew jia zhong her muey….” (Come…Teochew Original fish porridge…). The Teochew tradition already started right outside of the door with the boss marketing the shop to the passer by with his authentic Teochew accent. 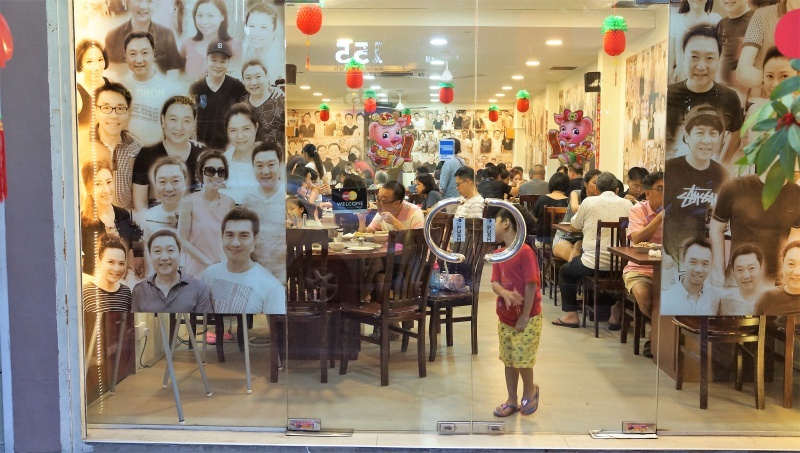 The restaurant is fully air-conditioned and every side of the main internal walls are pictures of the boss taken with local and oversea celebrities, seems like a good endorsement for it culinary skills. 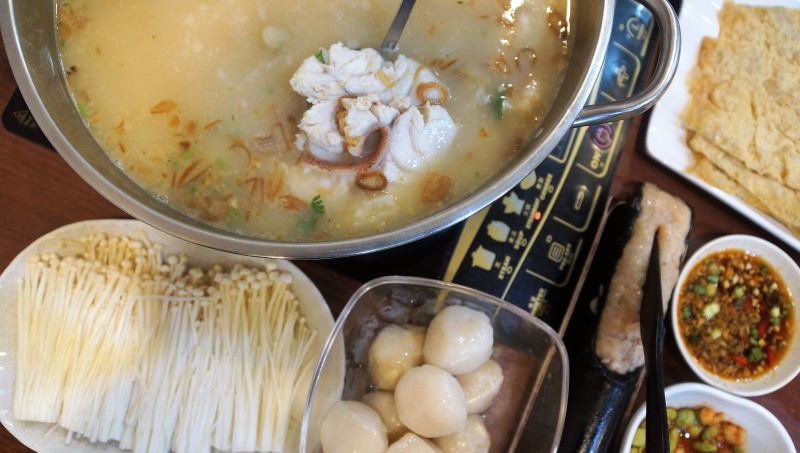 We like the seemingly enthralling pot of fish porridge but the steamboat was just equally alluring to the taste buds. In the end, the boss has the perfect suggestion to meet our craving of both, we ordered a pot of red grouper fish porridge to start with and just topped up the same broth in the same pot to continue our part two of steamboat feast, one stone to kill two birds for one price. Not bad, right? 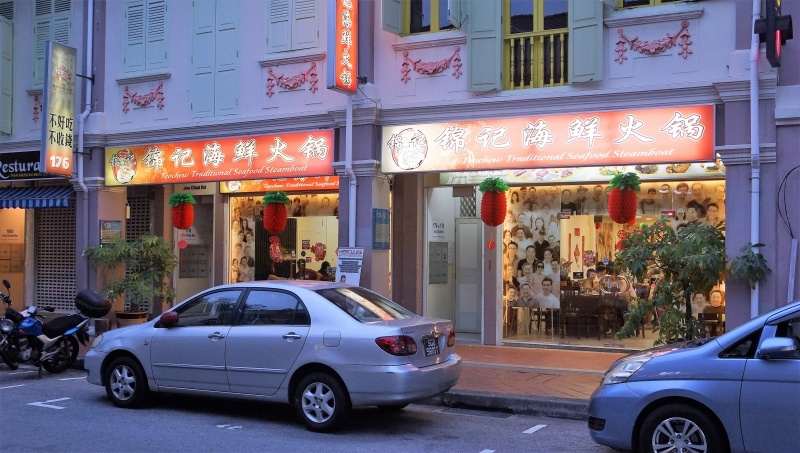 Jin Ji Teochew Traditional Steamboat occupying two adjacent units along the stretch of Joo Chiat Road, it is a road best known for its parade of many food outlets and entertainment establishments. On the neon signboard or the food menu, a bold tagline in Chinese out to challenge the fussiest taste buds – 不好吃，不收钱, literally meant Money back guaranteed if not nice, a confidence bold proclamation by the shop on their food. 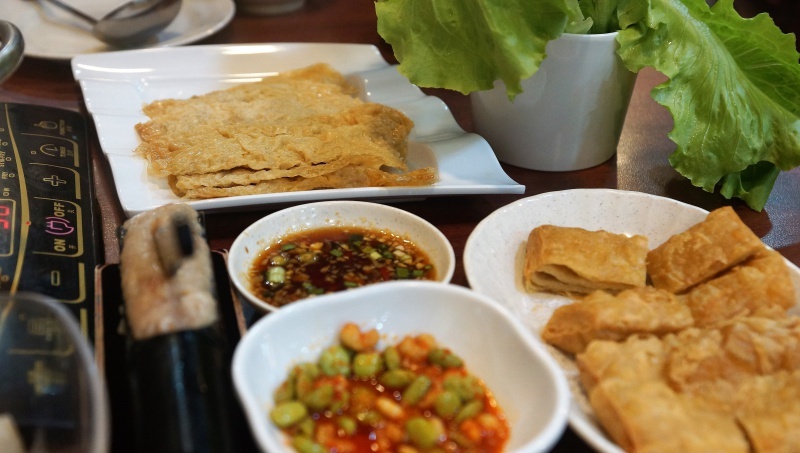 Besides the house signature fish porridge and steamboat, Jin Ji Teochew Traditional Steamboat serves traditional zichar dishes as well. The fish porridge ($30+$10 for CNY price hike) came with generous portion of sliced red grouper swimming in the steamboat pot of tantalising broth that brewed for long hours using fish bone and herbs, the milky white broth was spot on delivering the perfect sweetness and flavour, fish was fresh and went well with the grainy rice sunk at the bottom of the pot. The boss advised us to clear the fish porridge first before gorge on the steamboat so that the red grouper will not be overcooked. We adhered to his advice and cleared the fish porridge before topping up the broth. 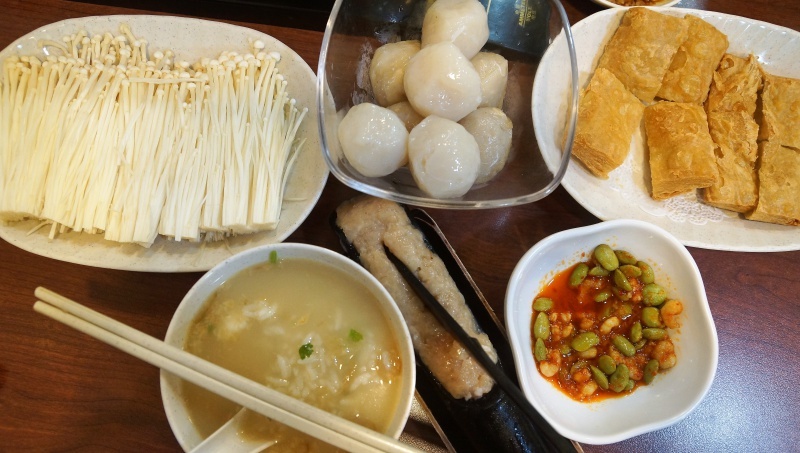 we threw everything in the pot, fishballs were springy and tasty, hardly detect excessive present of the flour, minced pork is their signature here and we are pleased with its tenderness and well-seasoned flavour, Dou Tiao ($6) or beancurd with fish paste has a great texture and freshness. Veggies were very fresh as well. 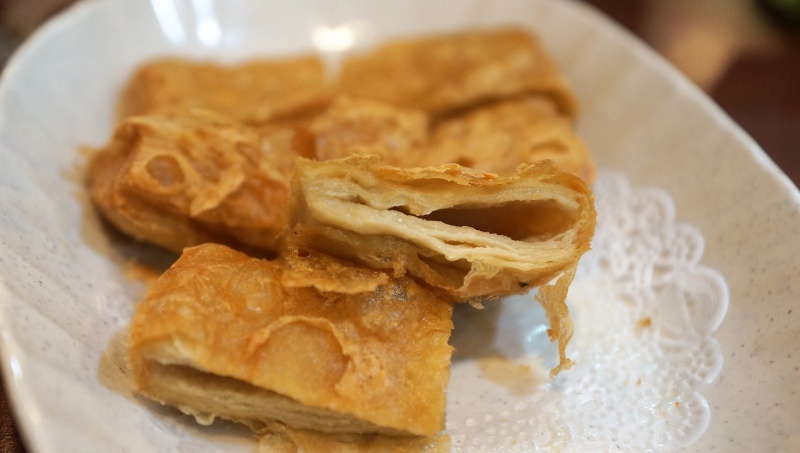 The only cooked dish we ordered was the Fried Dou Gen ($5) which was golden brown crisp outside and silky soft internally, not much seasoning was added and hence may appear bland to some if you are not able to appreciate the original taste of the beancurd. However, if you know how to enjoy the beauty of the original beadcurd skin, you will not regard ordering it. We hardly can find any fault for the fish porridge and steamboat items, Jin Ji Teochew Traditional Steamboat truly served food focusing the importance of freshness and quality, those dishes we have tried already by itself validated the quality of the food here, so, will it justify the premium price for the food? We think so from the top notch dishes.